In December of 2017, members of United Students Against Sweatshops, a student-led organization fighting for student and worker power, peacefully interrupted a Board of Trustees meeting in protest of Rutgers University's low minimum wage for workers. 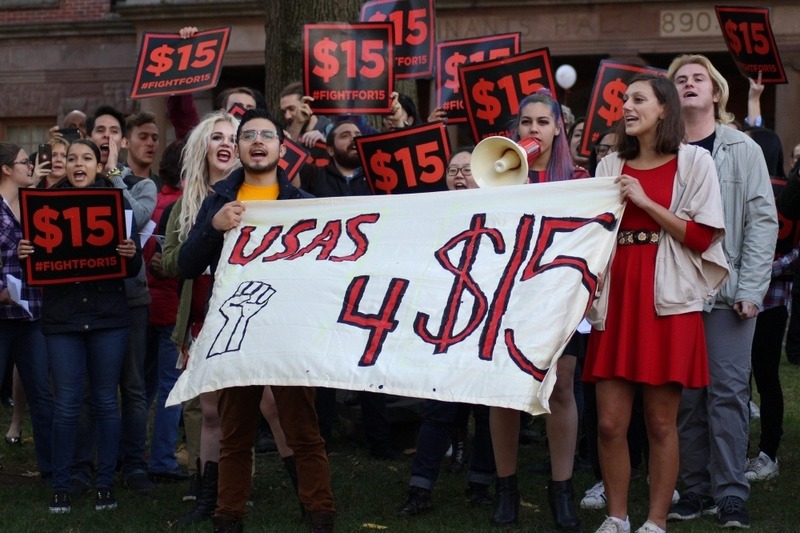 The protest, part of a campaign to raise the minimum wage for Rutgers workers to $15/hr, forced the administration to raise the minimum wage from $8.44 to $11. Now the University has wrongfully filed criminal charges against 11 of these students as a deterrent from further protests as they continue to fight for a $15 minimum wage. With a court date on February 4, 2019, the estimated legal fees to fight these charges are $1,000 per person, bringing the total to $12,000. Help Rutgers United Students Against Sweatshops fight these wrongful charges and continue to fight for worker and student power! Any funds remaining after court fees will be reserved for future expenses in USAS's campaigns. The case is closed and each charged member now owes the courts a little more than $1000 each. We have raised separately a bit under half of the needed $11,000+. The money donated to this gofundme will be used to directly cover the fines and court fees for each of the 11 charged members. Mary D'Anella-Mercanti, a member of Rutgers USAS core, will be withdrawing the funds in her name to her own bank account where she will send the money in checks equaling the price of the fines and fees to each charged member. Update: Three Rutgers USAS activists faced suspension for peaceful protests, and were able to with the help of a fantastic civil rights lawyer have their suspensions overturned. We need help paying for the remainder of the lawyer fees, totaling about $1,800.